All golf greens become worn when played on and need to be regularly renovated in order to bring the surface back to a suitable quality. Without appropriate repairs to the required standards the surface will deteriorate leading to further problems. Damage to grass surface such as divots, scrape marks etc. Compacted ground which indicates by poor drainage, high weed content, moss and poor grass growth. This can be done by hand or a machine known as a turf cutter. This method is used to remove damaged areas, turf contamination such as oil spillages from machines or simply to allow access to a burst irrigation pipe etc. Plugging or patching is used to repair or remove small patches of turf such as weed grass or damaged grass etc. Various implements such as a turf doctor can easily remove the section of turf cleanly allowing a fresh core from your nursery to patch into the area easily. For larger areas of the course requiring renovations greenkeepers will overseed. Our golf course grass seed, PERFORM: Tees, and PERFORM: Outfield & Fairway Seed have been specially blended to provide a hardwearing seed surface with high recovery rate. 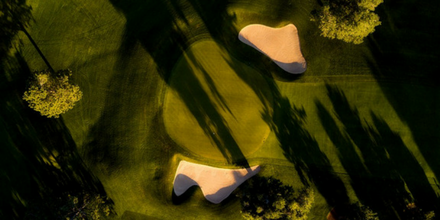 They include grass varieties such as Perennial ryegrass, Fescues, Browntop bentgrass and meadow grass, perfect for large amounts of use and fast recovery. With golfing often divots are left on the surface after play. It is vital that these divots are tended to maintain an even surfaced and weed free green. Divoting is one of the most regular methods of maintenance on any course and how it is treated depends on the time of year and amount of play. Read more about fixing divots here. Pitch marks are caused by a golf ball landing on the grass from a high trajectory. If not repaired they can affect the quality of the playing surface and stress the affected areas of turf. They can be easily fixed with the use of a pitch mark repairer.